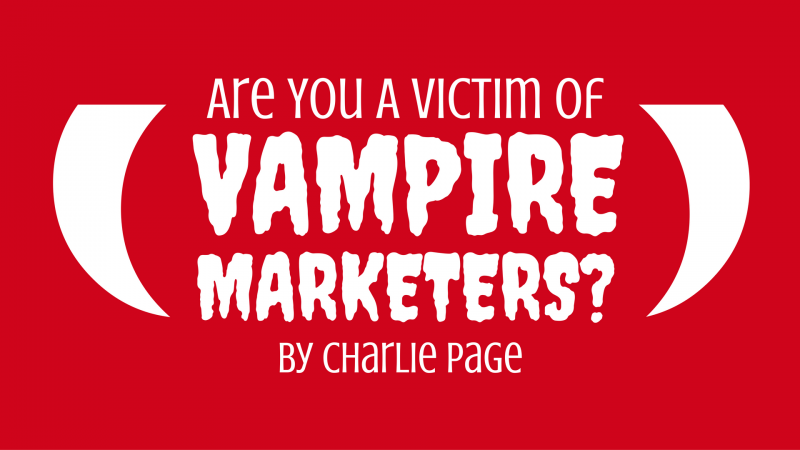 →Are You A Victim Of Vampire Marketers? Can this year be your best year ever? I believe it can. I believe the Internet levels the playing field of business in ways that are almost unimaginable. If others can succeed you can succeed too. We hear success stories every day of those who work hard, apply the fundamentals and end up with a real business to call their own. These successes come from every ethnicity, every country and every economic background. Yet so many still struggle. So many work endless hours to make money online and never earn a dime. Most who suffer this fate do so not because of their bad choices but rather because of the bad actions of a few online marketers who know how to prey on the desperate and under-informed. I call them Vampire Marketers. And one huge key to success online is avoiding the vampire marketers and their outrageous offers. Today I’m sharing the fourth article in my “best year ever” series. If you have been following along, you know that we are covering four topics. Four keys to building a lasting success online for you and your family. And today we follow up with Key 4 – Avoiding the hype. Let’s begin with a short case study. How bad can it be really? To illustrate just how hurtful these marketing methods can be I want to share with you the story of Pete. Pete is a real person (a member of one of my sites) but I’m changing his name to “Pete” to protect his identity. Pete is a well-meaning educated guy who wanted to quit his job and make a full time living online. He meant well but fell for the hype … hard. Pete become convinced that safelists were the way to go. Pete bought the hype that he could mail to “millions of opt in subscribers” every day by only paying a one-time fee. To Pete the logic seemed undeniable. After all, the people on the safelists had joined up and wanted to get Pete’s email, right? As I shared with Pete during a consulting call, the reason people join a safelist is to send email, not read email. In fact, many safelist systems are set up to help you avoid reading the email you will receive. Some teach members to get a Gmail account and never check it but to send as much mail as possible every day. Success becomes impossible if no one reads what you send out. But Pete was not to be deterred. He was in, all in. So he worked the system. He joined dozens and dozens of safelists. Some were free but many were not. And he worked them all. Here’s the thing you need to know – Pete worked his tail off. I mean he gave it the good old college try and then some. In fact, Pete spent 8 hours a day for NINE MONTHS using safelists. He was the poster boy for hard work. The results? You can guess it I’m sure. Pete made no sales, no money, built no list and ended up losing thousands. Over ten thousand in fact. The vampires had sucked him dry. You see, there are many vampire marketers in the land. Safelists are but one example. You know what they look like already. Of that I’m sure. You’ve seen the slick sales videos, the fake screenshots showing thousands in sales a day and felt the pull of the false scarcity they use as well. Enough about the problem — let’s get to the solutions. I believe there are five principles that will help you avoid the vampire marketing methods. Whether you have never been taken in by the slick talkers or you can fully identify with Pete, embracing these principles will help you find, and stay on, the right path. The plague of the online business world is the get rich quick scheme. Countless thousands have fallen for the lies, lost everything and are left wondering what went wrong. They were promised quick results but instead ended up wasting time, money and effort. These good people have a need – a real need – to make money online. Many are not our for greed or to get “rich” but to survive. To save their home. To rebuild their dignity. But none of that matters to the scammers. If you have been a victim of these vampires I have an important message for you. No one succeeds with their “secret software” or systems but them. Just like a pyramid scheme, the only ones who earn are the ones at the top of the opportunity. Here’s the key to getting past the disappointment and building a real business online. Stop blaming yourself for making the mistake and instead focus 100% of your energy on finding a business you like, you understand and one in which you want to work. Because the real bottom line is this – very few get rich quick. Very few get rich without hard work. When it does happen the success is often fleeting. The world is changing in many ways. But in this way it has not changed. Those who succeed work incredibly hard, are very patient and develop skills that bring success to them. So stop looking for fast results and instead look for dependable results. Look for something that is repeatable – something that provides a return on your investment of time and money most of the time. I know you know it’s true. And I know you are willing to work hard. Now it’s time to forgive yourself and move on. If you want to build a real online business it is important to choose something that interests you. Something that excites you. That thrills and delights you. That’s what I did. I love my work (it’s not really “work” to me) because all I do is help people succeed and learn more about marketing. Marketing and people are my passions so “working” is less about work and more about sharing. That’s a win-win for me! As I’m writing these words I can truly say that there is nothing in the world I would rather be doing than sharing this with you. So how about you? Can you make a living doing something you love? I believe you can. Not only do I believe you can but I believe you should make your passion your profession. There are many ways to do this. Too many to list here in fact so let me share three with you. Time has proven that you can make money online with almost any topic. So take time to identify what really races your engine and begin making plans to monetize your passion. If you do you will find your work has become joy. In a recent article I wrote about building your business on a firm foundation. I offer four such foundations for you to consider. If you would like to read that article you can click here. It will open in a new window. When it comes to choosing a proven path here is the heart of the matter. In business there are two paths – innovate or duplicate. It’s really as simple as that. Innovators invent new and exciting ways to do things. Bill Gates and Steve Jobs were innovators. Mark Zuckerberg is an innovator. While it’s true that innovators are often rewarded with massive riches, it is equally true that most innovators – the vast majority in fact – take huge risks, are misunderstood and fail financially. Innovation is fun and cool but it’s also incredibly expensive and risky. The thing about doing business online is this – there are already so many learning curves to navigate that navigating them all successfully AND innovating a new product at the same time is almost impossible for the average person. Ethically duplicate someone else’s success. Now by duplicate I don’t mean to steal someone else’s product and then compete with the original product owner. That’s just wrong – and it fails almost 100% of the time. What I mean is to duplicate the methods that successful people use so you can profit from them too. That might be with a product you develop or one you are promoting as an affiliate. Do the people in your niche blog? Do they build lists and use email marketing? Do they work together in joint ventures? Do they publish newsletters, either to consumers or others in the industry? Do they create products for people to buy? Do they offer an affiliate program for their products? What do people in this niche need that they can’t get easily now? These questions and more can be the starting point for your success story. The answers to these questions can uncover opportunity galore in the field of your passion. Don’t reinvent the wheel – use the wheel to ride to your destination in style! I think one of the biggest mistakes I see in those who struggle to make money online is giving up too soon. It’s entirely human to have expectations and get excited. Nothing wrong with that. But when we have inaccurate expectations we suffer disappointment. You see, we all hit the wall. We all suffer disappointment and frustration. What commitment does is change our response to disappointment and frustration. I believe the key is to be specific with our commitments. If you are going to invest time in a new business set a specific period of time. If you are going to invest money in a new business set aside a specific amount of money. If you don’t know how much time and money it will take to succeed in the business you have chosen ask someone in that business. Knowing these things will help you avoid hopping from one business to another, feeling like you failed the business when in fact the business failed you or you simply did not have the resources for that business in the first place. When an airplane flies from New York to London it takes a very direct route. The pilot and navigator calculate the shortest possible route, factor in wind and weather conditions and more. To the naked eye it would appear that the plane is on an entirely straight line, literally jetting to its destination. The truth is that our plane is making thousands of minor course corrections along the way. When the plane encounters turbulence it corrects course. Notice it does not change its destination … it corrects course and keeps going. It’s the same with us. We can reach our destination and achieve success online if we stay the course and are willing to make minor corrections as we go. Believe me when I tell you that there have been a thousand times I wanted to give up on working online. In the early years I quit my business almost weekly in my own mind. I had doubts, and plenty of them. But I did not give up. I corrected course instead and today the results are, to me, amazing. There is so much wisdom in that little saying. The first solo ad I ever wrote was horrible by any standards. But I kept writing them. I wrote ten a day, twenty a day and sometimes fifty a day. But then they got better. And better. If you try you will succeed. If you persevere time will become your ally. Be willing to forgive yourself. Be willing to commit to your success. Be willing to correct course as you go without changing destinations. Be willing to learn by doing – to do things poorly until you can do them well. If you do these things I believe this will be your best year ever. And that would be a beautiful thing indeed! Thank you Charlie for this information i realy did enjoy it,I believe that DOE SOLO Adds are the Best that any one wanting to do them can find,I am so glad to get your email this morning thank you for your wise information and help. PS Thanks again for a great Email. I agree and disagree. I do believe set it and forget it is possible, even though much of what you say is true. In one of your emails earlier this year I noticed you promoting pre-written solo ads for Empower Network. Why don’t you consider Empower Network members to be “vampire marketers”? I’m assuming that you don’t consider them to be because I think if you did consider them to be vampire marketers you wouldn’t create pre-written solo ads for them. Another great inspirational post, Charlie. You are right onto it. Purchasing my lifetime membership in your Directory of Ezines was one of my better decisions. Thanks for inviting me over to your blog.To read this great article on how to best use articles.Good job and i got some good tips in there. Thanks Zora – happy you enjoyed it! thank you for another sage post. I’ve unsubscribed from so many lists of “vampires” that I cannot even remember. Furthermore, I use gmail and that effectively blocks mails from “vampires”. Thanks Timo. Gmail does help with that. I maintain a separate email address for lists which keeps my primary address spam free. That works very well too. What an awesome post Charlie, its all about staying the course and not letting the little things get in your way, they’re just minor stumbling blocks any way. Happy you liked it. Staying the course is very important, especially when there is objective proof that the course is a wise one. Thank you for your comment. Thank you for your confidence Violeta. I don’t do one-on-one consulting anymore but both Directory of Ezines and Follow Up Selling Systems members have access to ask me any question they like. Great article Charlie, you got me all motivated there at the end. Don’t get me started on the vampire marketers. I wasted a lot of time chasing their bogus promises of success, though not too much money. Fortunately, I ran across Travis S., you and a few others who pointed me in the right direction. Now I do affiliate marketing, bum marketing mostly, it doesn’t feel like work and I’m actually making money. Keep the quality content coming, I try to read every post. Congratulations Mike! Thanks for commenting – I’m happy you like what I’m sharing. Always love your stuff Charlie and have read everything you’ve sent for the last few years or so… and yes… I’ve been bitten and hard. Vampires only bite little but this one bit me hard …more like a parasite and I’m certain this one’s smiling all the way to his habitat or hole. I’m on a Aged pension and have been for two years and desperately want to get off Government handouts. and build my own income which I know I’m capable of doing. My whole working life of 50 years evolved around customers both mine and customers of other people. Every job I have ever had and businesses that I’ve been involved in related to providing service to customers and I loved every one of them [ oops… I meant the jobs ]. Every one was treated with utter respect and honesty and never ever ripped any one off in my entire working life. I just loved the concept of providing a service to other people. Not for one minute am I suggesting that I have a rare talent… there a probably many more who are much better and have the passion that I still have of being of service to people. The very reason why I chose to join a particular site owned by a guy who seemed to know what he was doing and I’d eventually to hand over a small amount of my limited cash and of course he’d offered an up sell for a much higher amount which I’d accepted and assumed the lower amount wouldn’t be processed. Not being sure of this a few days latter I fired off a long email explaining what had happened. Guess what happened… N-O-T-H-I-N-G. Checking my Pay pal account the following month I saw that there was no reversal of the minimum amount and to top it off another two deductions for the month I was checking the outcome. So off with another email asking for a total refund and more than a several days latter came a reply for a counter offer and that I’d still have up to 45 days from the first payment to make an adjustment to my membership for the lesser amount and I will have to cough-up the cost of the Hosting which was included in the bigger package. So straight off with another email saying I don’t trust you any more… why didn’t you respond to my first email… give me back my money! One of his staff members sends me an email telling me that I should have sorted this out before the 30 day period as its now over… I’ll get nothing… so there! The wonderful ways of the Internet and its anonymity. So where to from here… I’m like Rottweiler I once had for 13 years and she was a great pal… once she got her teeth int to something she’d never let go and she’d drag you anywhere she wanted. I’m just like her… I never let go once I get done over. What makes it hard to come to grips with because of his manner of doing business and not responding in a timely manner Iv’e had do do without necessary items because of my fixed pension payments. First time was difficult but second time around… its just unreasonable with the attitude that he’s displayed… just like a parasite. PS Just needed to spill the beans on this one… hope you don’t mind Charley… will join with one day when I’m productive. I don’t mind. It sounds to me like your only recourse at this point is to dispute in PayPal. Sorry this happened to you. Thanks for the articles that keeps us going Charlie. After Google’s last search engine adjustment early last year which sent my website into cyberspace I spent way too much time trying to find a way to get back into profits at any cost and wound up chasing those shiny things and likely spent more money that I had originally made. I’m so glad I made the decision to join the DOE and FUSS to make me realize what a real business (online or not) is about. Patience and consistently executing the fundamentals taught will surely bring me back to success… long term success. Thanks for being a member of both Guy. You are on a good track now and can ignore the shiny objects while you focus on building a truly sustainable online business. Thank you for the article, Charlie. Thanks Frank. I appreciate your kind words. You work hard to help people who are trying to make it happen on the internet, but I still know it wont happen after trying for over 6 years, who ever you trust they are the one,s who are successfull. I hope things improve for you this year Malcolm. Six years is a long time of trying. As usual your writing does nothing but inspire others with your honesty and truth. You touched a raw nerve when you say that you nearly gave up many a time as it reminds me of myself, and where I am at the moment, so reading this article was just the tonic I needed to dust myself down and carry on. Your right there is more than way to skin a cat as they say! I actually wrote a post along the similar lines to yours above on my blog about a couple of months ago! Thank you for your comment. I’m happy you found it helpful. Good for you publishing your thoughts on a blog. That’s one of the keys to succeeding online in my view. Starting out with no real prior knowledge was costly for me, and it had to be a time when I really could not afford it, I wasted some money on products that did not work,and I joined safelists, that just ate time and produced little. But all the time I learnt from mistakes that I made. From my personal experience, to have success you need patience mixed with drive, you also need to weed out the bad teachers from the good. Once you find the good teachers you don’t necessarily have to buy from them you just need to listen to what they say. I have found the teachers that I use, all basically say the same things, and they all play down the hype. The expense comes when you are taken in by the hype, so no hype to me means worth listening to. Great observations. You don’t really need to buy things to learn – I could not agree more! Hi Charlie, thanks for another excellent article packed full of good, practical advice. As usual great & helpful comment & as another “Pete” thanks for caring & sharing. Hope the health side is improving for you. Thanks Brian. It is improving in fact. I believe this will be my best year ever health-wise. Thank you for your kind comment. Now there’s a word picture! Happy you found it useful. As always Charlie you’re like an oasis in the desert; shelter from the storm and a bunker during a barrage. Thanks for all your friendly and trustworthy advice. I’m happy to share. Thank you for your kind words Jim. I’m happy you found it helpful. charlie i have DOE and flowern up sealing system thank you. Thank you Albert. Those two sites are perfectly suited to working together to help people succeed online. I’m happy you have both. Thank you Charlie, you been giving lessons Its very great and precious. Thank you Amir. I truly believe like you do that success can be a win-win situation. No one needs to lose for people to win. Hello Charlie, Thank you for another great post. This one really mad me think. First, if they are known vampires why are we not alerted to who they are? So far in my travels only Shane Melaugh has a “Do Not Buy” page with explanations. Sounds like a real world law where the police can’t help till the crime has been committed… In my opinion, we should police our own. We are inundated with bogus and slanted product reviews why not real honest Marketer reviews? Second, I believe that most people who make the commitment to use and pay for a coach should listen to the coach. Or, have a lower fee and call it “Suggesting”. Mentor, Coach or Suggestor. Third, I did almost the same thing in my first 6 months. Although, I didn’t loose as much money as Pete. Fortunately, I found you and the DOE, Kim Roach, and Shane Melaugh. Now, I focus on principles and tactics than 3 click products and shiny things. We live and learn. And as others have stated before, you Charlie do make a difference! Thanks Kevin. I appreciate your comments. It’s vitally important to find people you can trust and it sounds like you have done that. Unfortunately there is just no way to police the Internet when it comes to vampire marketers. The anonymity of the Internet makes it all too easy to change your name and keep going if you get in trouble, even trouble with the law. Just think of how many there are who use X as their last name. Why would a person do that? I’m not judging but if a person won’t give me their last name I’m not sure I want to do business with them. I understand privacy but a pen name would work better than something that automatically raises a red flag in my view. I sure know what you mean by ‘Vampire Marketers’. We only need to look in our inbox to see who they are. And there are just so many of them. I believe that their game plan is to keep newbies as ‘newbies’ by deliberately causing them ‘Information Overload’ by constantly emailing us with a product that they try to convince us that WE MUST HAVE or get left behind and lose out. I have almost rid myself from all the sharks in the WF ocean. There are only a very small minority who actually offer something worthwhile. Mostly everything is rehashed trash with NO honest proof of results. They group and get together to discuss how they can empty our wallets – and one IMer recently emailed us telling us that he’ll no longer be promoting any more WSOs, as they couldn’t care less about us and only want to keep draining us dry. Just work consistently every day. Complete ONE chore at a time. Get good at one strategy at a time. Learn One software tool at a time and DON’T over commit to too many niches/projects at one time. All these things I listed (and there’s more) I have been guilty of. I have ‘jumped ship’ for 5 years and have finally stopped. It’s surprising how quickly one can make progress when you get FOCUSED and just take daily, consistent action towards a SINGLE GOAL! Anyway, that’s my two pence worth. Thank you for your comments Tony. I know there are many good people, and sellers, on the WF but it has come under criticism lately. If people would follow this one piece of advice, your piece of advice, they would do well. I agree about the refund idea. But even a refund does not replace lost time and the disappointment that comes when yet another thing does not work out. Nice Charlie. Very nice indeed. The rite pep talk at the rite time. Thanks I needed that. I’ll be in touch soon about a J V I need a day or two to design a proposal. Thanks again Charlie. Bruce D.
Sounds good Bruce. I appreciate your comment. Thank you, Charlie. As always your articles are very honestly written and explained. You are the best teacher I’ve ever had. Wow – that’s a great compliment! Thank you for saying that. You made my day! Thank you Charlie for everything you do for all of us who’s dream is to build a successful business online. I am proud to be one of your students and consider you to be someone I trust 100%. There are just very few great mentors with a big heart like you out there. I wish you to experience much less health challenges in 2013. We all need you. Thanks again for your honesty and powerful advise! Thanks Tony. The health is improving steadily. I believe 2013 will be the best year yet for that too! Thank you Charlie for telling it like it is. I will definitely use your advice to weed out the vampires from henceforth. Wishing you the best of health and success for 2013. Thank you for your comment Al. I wish you the same in 2013 and beyond! You are not far wrong in what you outlined above, and as for online Vampires, I’d call them snake oil salesmen, here’s some initials of a couple I know of; SC, TK, there are others, and if it were legal some online naming and shaming should be done. I’m on the wrong side of 60, and been in marketing of sorts all my life, I can smell a con artist from more than a mile away, and these guys work on the assumption that there’s a fool born every minute, so they always have a ready made flock of sheep to shear. It’s sad that bad people exist. But it has ever been so and I’m sure the cream will rise to the surface. Wonderfully inspiring and encouraging article.Full of genuine heart felt advice and well wishing. Thank you Charlie. Thanks Wendy! I appreciate you taking time to comment. You hit the nail on the head with this key article number four and Pete must be my brother from the school of hard knocks. I know that his and my shared experience is not what I expected to be like starting this year. Needless to say I am glad to know you and be able to share with you my appreciation for being what you are as you say you are. Prayerfully, I have climbing out of this tailspin and returning to a proper angle of climb towards where you are reaching out to us. Thanks Charlie, you have been more helpful than you know. Best to you and the family and staff. I’m so happy you find it helpful! I appreciate your kind words more than I can say. I know you will get there as you keep moving forward and hope I can play some part in your progress. I’m glad you found it helpful. I think we’ve all fallen for the hype to some degree. The more we lift each other up the better we all will do. Yep, I’m one of those people that bought some of those “one-click wonders” that was going to make me rich in 30 days. Learned my lesson pretty quick, thank goodness. Found me something that not only makes me money, but I truly enjoy doing. Going to stick with it, too. I’m happy to hear you have found something that’s working and that you enjoy. Congratulations! Hey Charlie, All I can say to this is:) Very VERY good advice. You hit the nail on the head my friend. I know for a fact that many newbies have fallen victim to this, and even I did when I was a newbie, but a good lesson was learned and many readers will also benefit from this article. So thanks for sharing. All the best! Happy to share Leigh. Thanks for leaving a comment. I appreciate hearing from you. No problem Charlie, You’re welcome! Tony – I agree and disagree a bit. Yes, our actions are our own – that is true. But for people who have zero experience online or with technology to believe that software (such as the one-click garbage) could do what the seller claims it can do is believable to me. I think this is where people get hurt the most — not knowing what technology can do they fall for the lie more easily. I appreciate your comment. Charlie, you must have been reading my mind. The moment you sent this email is the very moment I was thinking about buying a product for internet marketing that will cost a lot more money than if I did it my self. This article really saved me a lot. Thanks! Excellent timing! I’m so happy it helped. I’ve been praying for you Bobbie. I hope things improve soon. Thanks for taking time to comment. Thanks Mark. I’m happy you found it helpful. Nothing wrong with taking a step back when you need to. The real key is knowing when to make that move! Loved your article – as usual. You always inspire me, and encourage me. The Zig quote is great. I heard a similar, but not as elequent, the other day – Take imperfekt action today! Thanks, Charlie. P.S. Are you going to get time to continue with your Curation course? Thanks Tom. I am going to do more on curation. I realized I had to finish this four-part series first and then could pick up on the curation series. More coming on that very soon. Another nice and very much needed article Charlie. Thanks Willie. I hope you are well. Always good to hear from you. Thank you. I so appreciate your insight and wisdom. It’s encouraging. Thanks Phyllis – I’m happy you like it. Thank you too for taking time to comment.